The closest thing to an acne cure is an acne pill. An oral treatment circulates your system with acne-fighting ingredients that help limit and prevent breakouts before they become a problem. Although some experts argue that diet plays no role in the formation of acne, there is evidence that suggest eating a balanced diet with the proper nutrients will help to reduce instances of acne. Acne-d claims to offer the solution to your troublesome skin with a simple pill. This oral acne treatment is advertised to reduce inflmmation, detoxify the body, moisturize your skin, and fight skin damage. Because Acne-d targets acne at the source we have to wonder if it could be more effective than your typical topical acne treatment. Topical treatments work well to erase existing acne, but the acne pill Acne-d digs deep into your system to shield the skin from future flare-ups. 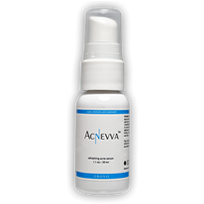 Acne-d is an oral treatment for all types of acne. 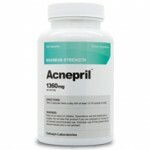 This acne treatment has a formula that provides a lot of essential nutrients and natural herbs to strengthen your skin. Unlike topical treatments, Acne-d helps cleanse the skin without irritating it further. Within two weeks, clearer skin should be evident. Somewhere between 30-45 days after you begin using it a completely clear complexion should be achieved. This time frame is a little longer than alternative oral treatments but still may be worth trying. The proprietary blend includes minerals, vitamins, nutrients, and acne-fighting herbs. Combined, the formula offers antioxidant benefits and immune system support. Some of the ingredients in Acne-d include horsetail herb extract for smoother skin, green tea extract to fight free radicals that damage the skin, burdock root powder to detox, and vitamins A, C, and E to support healthier looking skin. 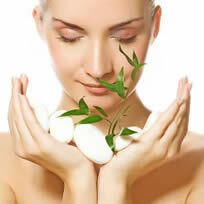 Acne-d should reduce inflammation, destroy acne-causing bacteria, detox the body, and heal the skin. 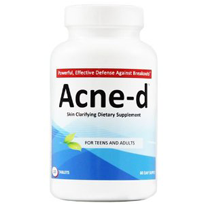 While many of these ingredients have the potential to lead to the results you are looking for, Acne-d includes them in a proprietary blend which is a bit concerning. When a product uses a proprietary blend it frequently means that they are trying to hide the exact amounts of each ingredient because they know they have included enough for the advertised results. That may not be the case with Acne-d but use caution when considering it. The best way to get rid of acne immediately is with a topical treatment. One of the best ways to keep clear and smooth skin is with an acne pill. Acne-d is a great way to be proactive about acne, but it will take time for the pill to remove existing acne. Because they offer a 60 day money back guarantee you can be assured that your investment in clearer skin is protected! However, 60 days may not be long enough to evaluate the long term results with Acne-d usage.